2. lay down a tablecloth. it doesn't always need to be a traditional tablecloth, you can use fabric, sheets, a shower curtain, a quilt or throw. anything that covers the table will work. 3. add a contrasting runner. again, this can be anything- wrapping paper, rugs, scarves, doilies, trays, mirrors, empty frames, wood planks. 4. build your centerpiece, and keep it low. you could include fruits, nuts, succulents, candles, greenery, sticks, cylinder vases wrap with ribbon, wheat herb leaves, or burlap and candles in them. 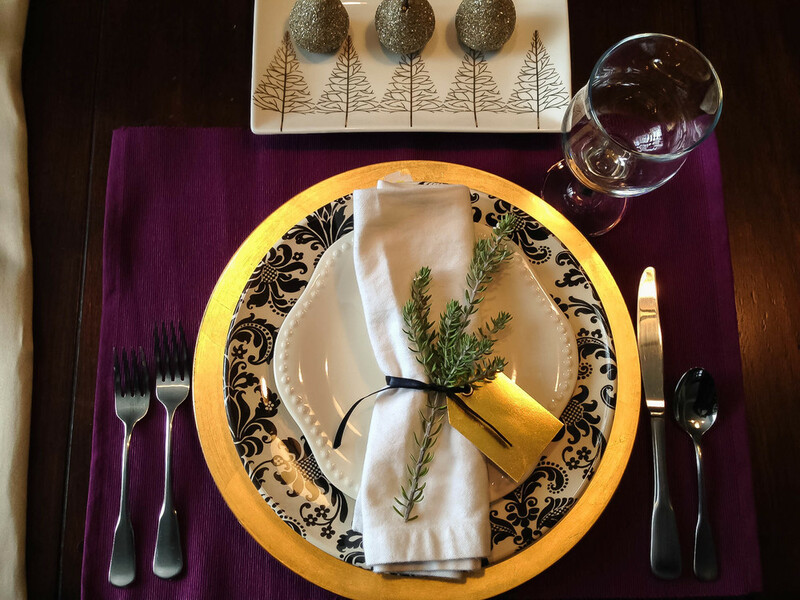 5. create your first table setting (see our instructions here). 6. mix things up. everything doesn't have to be matchy-matchy-green-squared. 7. add flowers. no table is complete without flowers- add them to your centerpiece and even your individual settings. 9. get creative. you can add to anything on your table, or even decorate your chairs with wreaths, ribbons ornaments. don't be afraid to view things differently- you can pull something off the wall to use as your centerpiece, use dishtowels as napkins, wrap your silverware in a thousand different ways. once everything comes together, no one will second-guess you. this is my favorite table setting of today's post. not only does it have the best colors (which i think should be everyone's christmas palette), but also the cutest place card. for this table, bobette chose to forego the tablecloth and just use her chartreuse runners. the centerpiece is a glass vase with succlents. 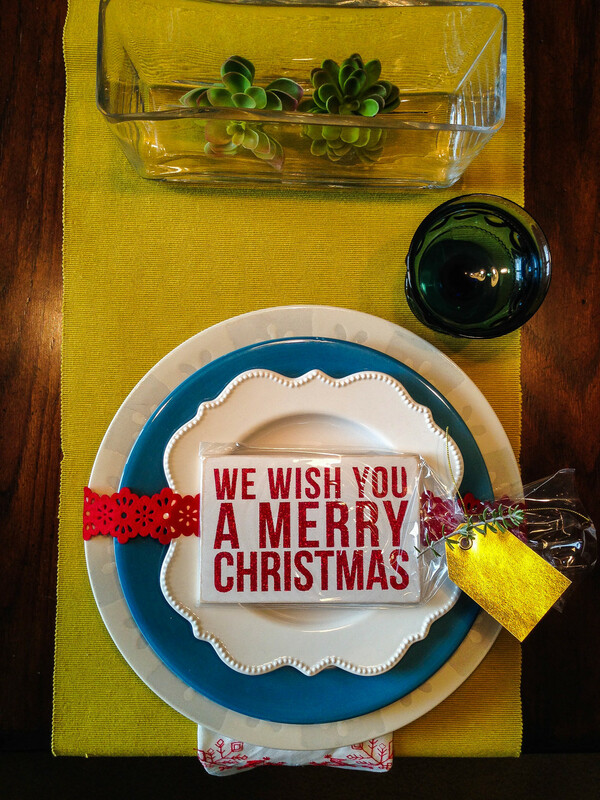 we wrapped the plates with a red ribbon and put her festive napkin underneath. we added a sprig of rosemary to her place card- and a gift for our guests to take home. who wouldn't want that 'we wish you a merry christmas' sign? the glassware is a vintage goblet. i love the color palette of this one- that rich purple makes it fit for a king. for the centerpiece, bobette used a little reindeer platter with glittered pears. she used her gold chargers and black and white damask plates. she wrapped her napkin with a sprig of rosemary as her place card. this table setting uses the more traditional red and green palette, but we've updated it a bit. that red chevron table cloth is actually a rug (we cleaned it, we promise). we did another succulent centerpiece and leaned our mini holiday sign up on it. we used a simple white plate with a red glass one. again, we used the napkin as the place card holder, but wrapped it in red pom-pom ribbon and used our mini chalkboard signs. oh, and we were dying over the addition of the magnolia leaf- it really pulls the whole thing together.